I did 9 miles and felt really good. I’m going to wait another day or two to work on tempo or speed to make sure I’m fully recovered from the marathon. Post-run I had a huge green smoothie but I think it might be time for me to transition to a fall breakfast too! I feel super cold now! Brrrr. 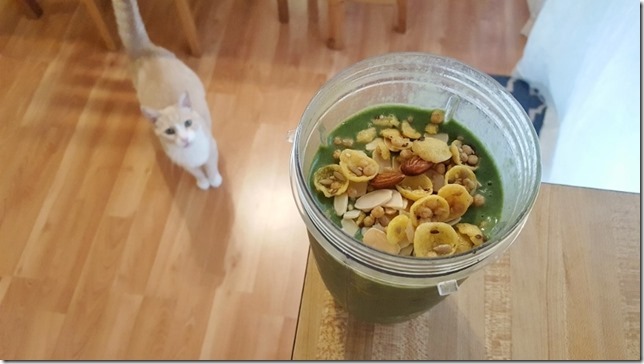 But, I love these smoothies. Maybe I’ll just eat them in front of my portable heater? I think it’s time to transition to warmer running gear (and warmer breakfasts). 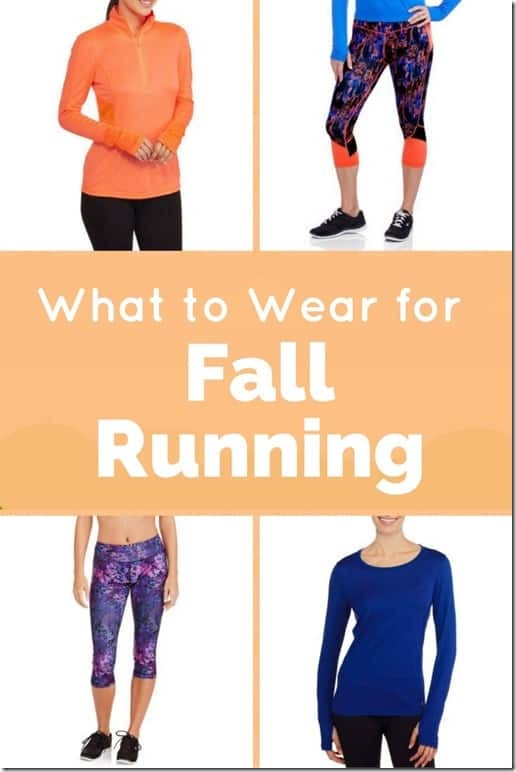 So I’m sharing some tips on how to dress for Fall Running. I’m working with Danskin Now to share these tips. The gear above is available online or at Walmart. From clockwise: pullover / capris / long sleeve / capris. 1. Keep your base layer sweat-wicking. Your sports bra and tank / shirt should be sweat wicking to keep you from getting soaked. Even if it’s cool out you are going to warm up and start sweating. If you are wearing non-technical fabric you clothes will get heavy and make you cold and clammy. No thanks! Make sure the clothes closets to your body are made to wick sweat away. I finally found the best sports bra for me and have 4 of the exact same ones. And truthfully I’m considering find one for every day of the week. 2. Dress warmer – but don’t overdo it. As the weather gets cooler I usually wear capris and a tank top OR long sleeves with shorts – but not both. I hate being cold, but after a few minutes of running I start warming up fast. 3. Choose BRIGHT colors over dark ones. The days are getting shorter. If you run around dawn or dusk it’s important to dress in bright colors so cars, runners and cyclists see you. Skip the black or camouflage and choose colors that can be spotted from the moon. Then, the aliens can cheer you on from space! 4. Wear gear that makes you feel good! I hate wearing running clothes that make me self-conscious. If something doesn’t fit right or makes me feel big, clumsy, awkward – I don’t enjoy my run. 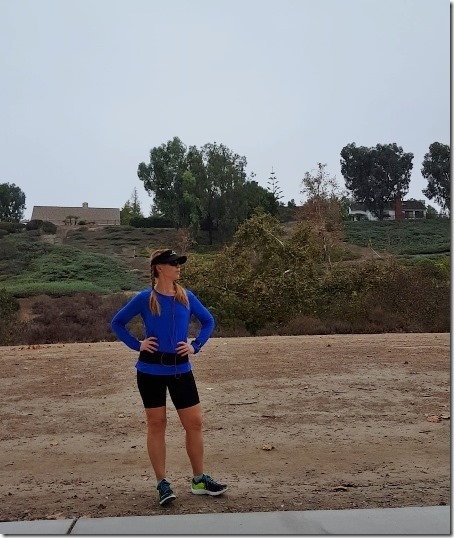 Choose running tops and capris/shorts that fit you and make you feel FIT! You are running. You are awesome! 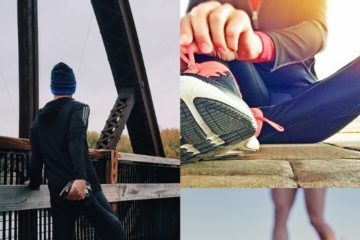 Own it and dress like you are a running rockstar. I think Fall is my favorite time of year to run because the weather is ideal for training. It’s also a great time to dress cuter for running. In the summer it’s all about surviving the heat. In the winter staying warm and bundling up is the priority. Fall weather gives us more room to dress in fun, bright patterned capris and tops. Danskin Now has a lot of fun options for patterned capris and ones with mesh detail that look cute and keep ya from over-heating. Question: Does it feel like Fall where you live right now? What’s the weather? This post is in partnership with Danskin Now. All opinions are my own. I run early in the morning (4:45) and this morning it was cold 43 degrees! I wore leggings and a long sleeve top and ran 5 miles. Really warmed up about 2 miles in and wished I wasn’t wearing the long sleeves! Thanks for the tips! It’s been in the 50s and low 60s here. Tomorrow it is going to be in the low 40s! I’m running about 7 miles. This was helpful! I never really know what to wear when it gets into the fall. Every other year I’ve stopped running when it got cold out. This year I want to keep running cause I don’t have a gym membership anymore. Haven’t you lived in SoCal all your life? I’m just gonna say it: you have no authority to discuss “fall weather”. You have not suffered enough. It’s beautiful here in NYC. Sunny and high 60s. I’m not running this week as I’m recovering from my half marathon this past Sunday but I have been taking the dog to the park for a long walk every afternoon. October is my favorite month and this is my favorite weather. I usually wear long sleeves and shorts or capris. The leggings and running vest don’t come out until it’s in the 30s. I am also a huge fan of running sleeves. I wear them with a tank, and when it gets warm out I roll them down or take them off and tie them to my spi belt.